THE NATIONAL TRANSPORT Authority says it is “actively considering” the introduction of a 24-hour bus service between Dublin Airport and the city centre. It follows the introduction of a new 24-hour service on Bus Éireann Route 220 between Ballincollig and Carrigaline in Cork last Sunday. This week, Fine Gael TD Noel Rock called for the authority to immediately prioritise a night link between Dublin city centre and Dublin Airport, saying that the move “makes sense” as the capital becomes a 24-hour city. “How on earth have the NTA prioritised a 24-hour service from Ballincollig to Carrigaline over the much needed and often requested 24-hour service to Dublin Airport?” Rock, a member of the Oireachtas Transport Committee, asked. More than 30 million passengers used Dublin Airport in 2018, and the number of jobs supported and facilitated is in the region of 120,000, with employees often having to get taxis to and from work. 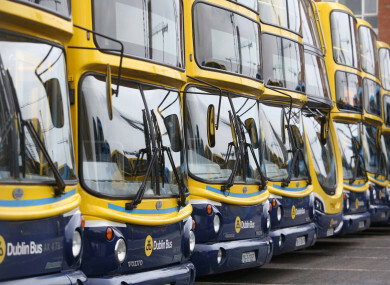 However, a spokesman for the NTA revealed that the authority was already looking into a 24-hour service as part of a major expansion programme of Dublin Bus services. “Improvements to services are being introduced on a phased basis as driver and vehicle resources become available following the transfer of routes to Go-Ahead Ireland,” an NTA spokesman told TheJournal.ie. “As part of this expansion plan the NTA is actively considering the introduction of 24-hour services on a number of key corridors. A Dublin Airport spokesman said that the hub supported all efforts to expand transport options available for passengers and staff to access the airport. The NTA added that it has not prioritised Cork over Dublin as Rock suggested, saying that the 24-hour service on Route 220 was implemented due to driver and vehicle resources becoming available. Email “National Transport Authority 'actively considering' 24-hour Dublin Bus service from Dublin Airport”. Feedback on “National Transport Authority 'actively considering' 24-hour Dublin Bus service from Dublin Airport”.